The babes at Missguided have dropped so many new plus size pieces onto their website for autumn. When I visited their HQ as part of the press preview for The Curve Fashion Festival, they’d said that they were going to be adding around 100 new pieces in September and were planning on dropping an amazing 85 each month thereafter and if the website currently is anything to go by, they weren’t telling tales! The autumn collection at Missguided features the latest on trend colours, styles and fabrics for the season ahead and I for one am SO excited to see what else they come up with… I’ve been reliably informed that wide fit shoes are heading our way this autumn and that swimwear is in the pipeline for next year girls! If you follow me on Instagram, then you’ll know that I’ve uploaded a new video onto my IGTV; a haul of 4 gorgeous pieces from Missguided that you can WATCH HERE. First up, there’s a piece that I’ve wanted to see hanging in my wardrobe since the dawn of time, a plus size faux fur gilet waistcoat. 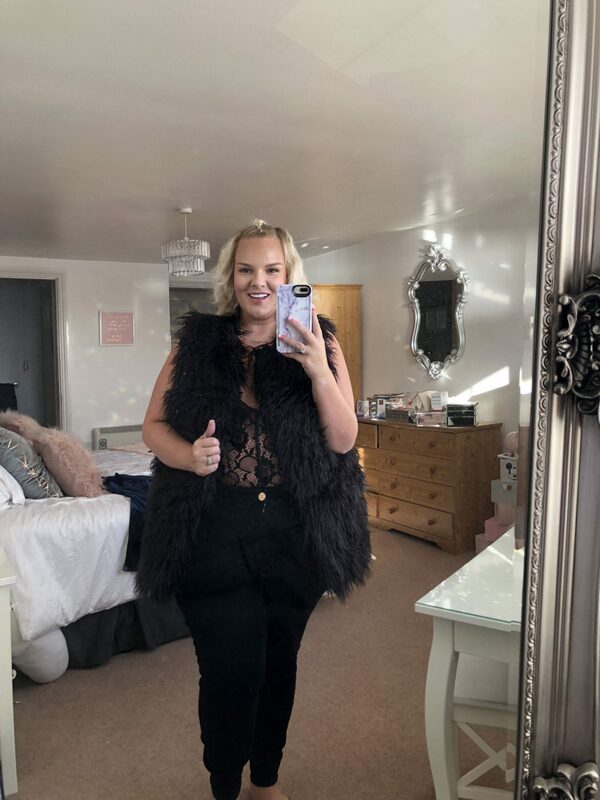 The Missguided Black Shaggy Mongolian Gilet is the first I’ve come across like it and I cannot begin to tell you how happy it has made me feel owning this baby! Put it this way… it arrived on Saturday and I’ve worn it EVERY DAY since! This is the perfect piece for styling with an all black outfit; think a long sleeved, slim fit black top, favourite black skinny jeans and boots, with sparkly silver jewellery. I cannot wait to wear it like this but I’ve also been styling it up with my faux leather mini skirt and thigh high black boots! I bought these the Christmas before last but you can find similar pairs in wide fit and wide calf sizes here and here. Then there’s the Missguided Plus Size Black Lace Pipe Detail Bodysuit that I plan to wear underneath the Missguided Plus Size Navy Velvet Belted Jacket. I’ve searched high and low for a bodysuit to fit my body shape and finally, I’ve found one! It fits like a dream as it is long enough to fasten up underneath me, even with my lower hanging tummy, and it stays fastened when I move about in it! The navy belted jacket is the most gorgeous sumptuous fabric and the midnight blue shade is stunning. This is my favourite tone to wear in the winter months when the jewel colours are well and truly in and I can’t wait to pair this with my black skinny jeans and bodysuit. I reckon it’ll look gorgeous worn over an LBD too. Gone are the days when I’d go out sans jacket so this will be a luxe touch to my night out ensembles this autumn and winter! Last but by no means least, is the Missguided Plus Size Striped Balloon Sleeve Jumper that I first spotted at the blogger breakfast at Missguided HQ. There’s nothing I don’t love about this jumper, from the colour palette to the super soft and snuggly knit fabric, it is every inch the cosy autumn jumper! Those balloon sleeves are a new style for me and I love the effect that they have, especially as they make this jumper look quit slouchy and you can pull the ribbed cuffs up or down and the same with the bottom of the jumper too, making it look longer or more cropped and baggy! Four completely different items but all gorgeous in their own right as I’m sure you’ll agree. I will be styling these up over on my Instagram very soon so do check my page out there to see how I wear these pieces out and about. 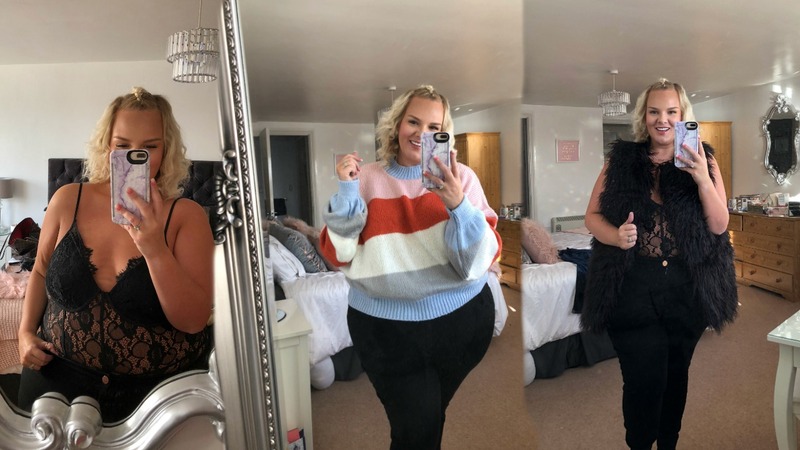 Don’t forget to watch my video here and if you want to see what else Missguided have to offer, head to their plus size section here. Love this haul? Pin it for later when you’re online shopping! What is your favourite piece from my haul? Have you shopped at Missguided before? 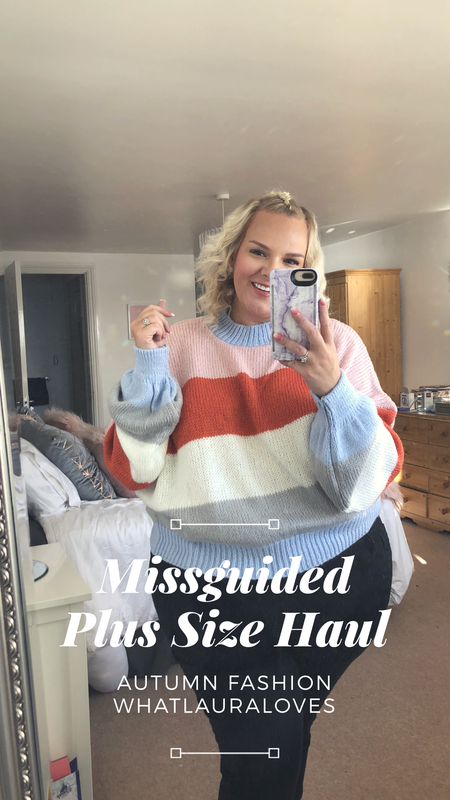 I had no idea Missguided had such a fabulous plus sized range! I will definitely have to have a browse.